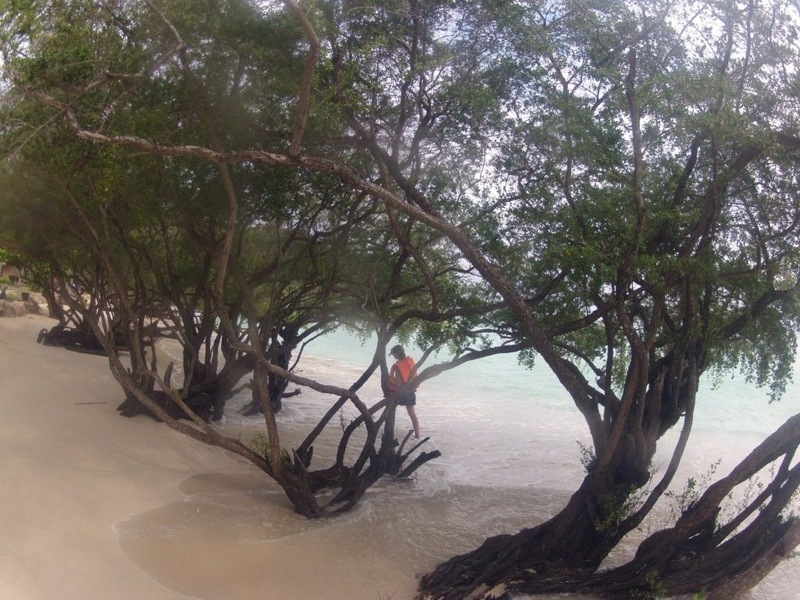 New Years Peeve… (on the beautiful Koh Tao) | Blog the world!!! Our emotions only resembled disappointment mind, because at this time of year (New Years) any room on Koh Tao is a blessing. I guess we felt somewhere between disappointment and relief. Disappointed relief. This wasn’t my first time on Koh Tao. Four years ago I’d stayed at Lotus Guesthouse on the island with two friends. We’d slept in small huts just off the beach and were greeted by two happy, large ladies every morning, along with their small dog. The island only had one road and we’d accidentally found a snorkelling hotspot where we’d seen fish, sharks and colourful coral. There was a tiny private resort there but they were more than happy for us to hang around. This time we wanted to find the bay in an attempt to overcome Gemma’s fear of water. I should make this clear though – she is scared of water, but sometimes she showers… sometimes. Koh Tao now has so many roads it’s almost hard to get around, but despite this we’d managed to find out that the bay, where four years ago I’d managed to see sharks, was quite aptly called ‘Sharks bay’. “Holy **** mother **** of hell” I screamed as I jolted straight up in the mouldy box that was posing as our bed. I’d just managed to sleep through the sounds of insects and badly fitted electricity when I’d been rudely interrupted by the sound of maybe a robber? Maybe a rat? Maybe a… Well it turned out to be a large gecko. But it sounded REALLY scary. Neither of us slept for the rest of the night, opting instead to huddle in the middle of our box and shake. Once the sun had finally managed to rise (and believe me it took its sweet time) we set off into Koh Tao. Not only is there more than one road these days, there are loads of new diving schools, more than the five restaurants I remember, and so many hotels it was hard to fathom the squalor we’d slept in the night before. Even the Lotus Guesthouse was The Lotus Resort now. The island still hasn’t lost its rustic charm though and I was happy that the locals are benefitting so much from Thailand’s touristic economy. More than that I was pleased for those large ladies who were so welcoming four years ago – I bet they’re even larger now! That night was New Year’s Eve and this year, instead of spending it celebrating the London Underground being open and free all night, we celebrated fire poi on a tropical beach. 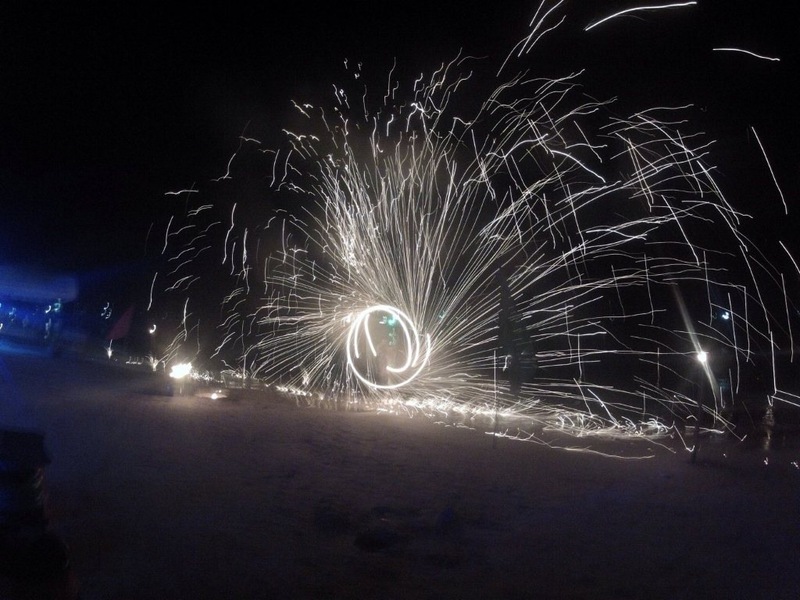 Despite one of the poi nearly hitting me on the head, nearly concussing me and nearly setting me on fire, this had to be one of the best New Year’s Eve’s we’d ever had. And to top it off we’d even managed to convince our (as the Lonely Planet would say) ‘eccentric’ landlady to give us a better room for our second night! “I’m going to shops” she told me. “Ok” I said. And then we stood looking at each other for a while. Me because I didn’t know why she was telling me she was going to the shops and her because I was wearing nothing but a towel. “Well” I said, awkwardly backing into the room. “Thankyou. And have fun. I’m going to have a shower”. “Yes”. I affirmed wondering whether she just expected me to say a sentence at random back to her. “And now I need buy things”. “Ah I see!” Finally a huge smile crossed my face. I understood. She wanted me to pay for the second night. I paid and then paid for another night to avoid the same happening the next day. And then my smile of understanding became a smile of relief. She had gone. Maybe to the shops. Probably to the room next door. Possibly to bury a body. Despite our mild hangovers and slight irritation we rented a moped and set off to find Sharks Bay. Although it was only a ten minute ride, it was easy to remember why I’d fallen in love with Koh Tao four years ago. The island is still cloaked in dense greenery, the old road is still broken and cracked and just outside the town you feel a million miles away from life as we know it – like the better parts of Koh Phanang, it’s a jungle island. Sharks Bay, it turned out, had also fallen victim to Koh Tao’s tourism boom. The only way to the beach was through the tiny private resort I’d seen four years ealier, except now it’s much bigger and you get the feeling they wouldn’t appreciate a couple of backpackers turning up with snorkels… The bay can be enjoyed either by staying there or by pretending you’re staying there. We went with the later, putting on our best posh voices and saying things like “is there cable in the hut dear?” and “I hear the lobster’s divine”. The resort was nothing like our asylum of a hostel, the sand was white and the sea was turquoise blue. Unfortunately the water wasn’t transparent and the snorkelling not quite as I’d remembered. It wasn’t until we’d started making our way back that we stumbled across an old wooden sign that said, in faded blue paint, ‘Sharks bay’. A short and reasonably treacherous ride up and down a dusty path that the bike could only just tackle, we found it… It wasn’t the Sharks Bay of four years ago, that’s now a gorgeous but populated private beach. But instead a small sandy bay covered in vines and surrounded by rocks. A few travellers were relaxing, a couple of beach huts were perched on a cliff just above the bay and some coconuts bobbed in the water. But more importantly, the sea was full of fish. As soon as we dipped our masked faces under the water we saw black and orange sea cucumbers hugging the dead but elaborate coral. It was tranquil. Shoals of fish swam past us, some colourful, some electrically so. I’m not sure the species, but one type of black fish proved brave by coming up to me and Gemma to stare at us for quite some time. I guess we must’ve looked pretty strange to them. “Are you ok?” I shouted, worried she might be scared when she realised how far away I was and how far from the shore she was. “Yeah” she shouted back. “I’m looking for sharks”. Well. She’d clearly made her peace with the sea. I dived underwater to follow a stripy purple fish and enjoy the peacefulness of our underwater paradise before we had to return to our guesthouse. If the morning of January 1st sets the tone for the year, we’re screwed. But if the whole day is anything to go by, 2013’s going to be a good year. We’d enjoyed one of Thailand’s exotic islands by bike, had fun gate crashing a tropical private beach and snorkelled with thousands of the Gulf of Thailand’s fish. And if we have to deal with a few ‘eccentrics’ along the way, well I guess that’s fine with me. Before we left Koh Tao I asked our landlady where the nearest ATM was. She responded by ordering me to get on her bike. I know she meant well, but I didn’t. I think that’s where she keeps her axe.